Late last fall while bagging leaves, I discovered this tiny marvel of ornithological engineering in the middle of our backyard. I’m fascinated with birds and their nests. Imagine being able to craft the perfect home for your family with just a beak and twiggy feet? A feat, indeed. I took this miracle into the house to show my husband, who promptly denounced it, saying, “It’s got bugs!” For the record, it did not have bugs, but it did have the power to infuse me with possibility, every time I looked at it. 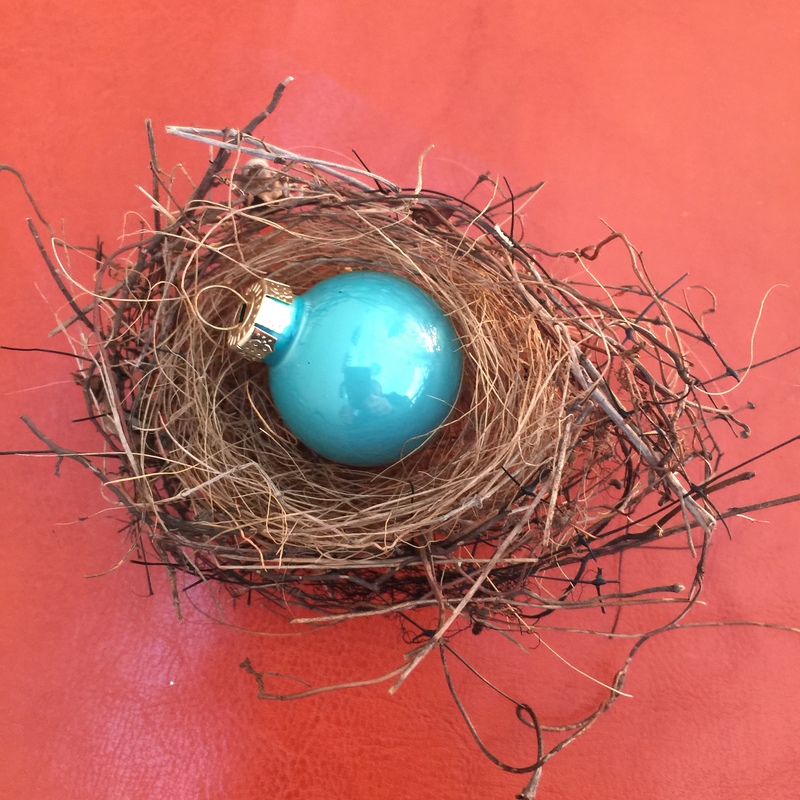 It sat on my desk through the fall and into winter when I repurposed it with a small blue Christmas ball to celebrate its beauty during the festive season. I think even the former owner would approve. For this challenge, show us something you’ve put to new use. Maybe it’s an old hammock that now forms the climbing wall for your clematis. Perhaps it’s as simple as the matchbook that supports the short leg of your chair. It could be the shedding hair you comb from your dog that will warm the birds’ nests around you. All out of clever? Look to your family, friends, and neighbors — what canny bit of DIY recycling ingenuity has recently impressed you? Up for a bit of extra credit? See if you can capture an image that not only represents “Repurpose,” but also bucks “Conventional Wisdom” — this week’s Discover Challenge. What a wonderful photo! And I am looking forward to finding an appropriate photo of my own for this challenge! This is a truly beautiful image. Thank you! I love that auto arch! Cool photo. I love what you’ve done to your home! Er, the bird’s home. I’m sure they would approve. Good ol’ tire swing. Nicely done! What a beautiful photo! I am offering a reflection on repurposing in the Women’s Marches . . .
What a wonder filled way to repurpose the nest. Thanks for sharing. What a great tip! I bet my husband will appreciate that. Love this! I even repurposed this post! I love the patterns and texture in texture in your photos. Lovely! Well, I am totally blind so I cannot do a photo, but my job as a writer is to make the reader see what I see when I describe it, so here goes. This might not seem like a big deal, but to me it is indeed. You see, not only do I have blindness to deal with but I also deal with short-term memory loss. So a few weeks back I was doing some cleaning out of rooms, packing things away, getting some ready to donate, and finding uses for others. I was just about ready to quit for the day when I found this little two shelved table on wheels sitting all alone in the corner of one of my extra rooms. Just as I was about to drag it into the get rid of pile, I had a thought. I looked the table over. It was wooden, and quite stirdy. The wheels all worked, and it was a decent size yet not too heavy. I rolled it into the living room, and dusted it off, and then I found that not only would it hold all that I need during the day, but it was the perfect height for me to sit on my loveseat comfortably and type on my laptop or with my bluetooth keyboard, and a friendship between me and it began. I hurt my knee and this table took on a whole new meaning and purpose. I gather all that I need for a specific room or place within a room, place it on the table, and easily move it from place to place. I’ve made a sort of a portable central command post out of it, and it is most wonderful. Also just this day, I found that an old that-bag from my transit company serves as a great way to keep track of small things which like to fall off of my magnificent command post. So I have taken some old things and given them new lives. Awesome too be sure. Maybe not as magical as your bird’s nest, but for sure a wonderful thing for me. It has helped all things become easier, and has increased my ability. Thus increasing my positive perspective, and this in turn inspires me, thus assisting me with my writing. Doesn’t get better than that for me. Thanks for sharing and inspiring. Blessid be. Your “portable central command post” (love that phrase) is brilliant and a wonderful response to today’s prompt, “repurpose.” Thank you for painting a vivid picture in my mind. Be sure and check out our blog. Thanks again. Blessid be. Hi thanks for reading and replying. I have a question. I want to write a prompt post on my blog and link it back to you when it says add a link does it mean include the URL for the prompt? Explain? Sorry know I should know, went and read instructions but must be missing something. I think the networking possibilities of doing such and exposing myself to other readers, and writers is a good idea. I so very much wan to do good work. Thanks and have a great day. Yes, if you include the link to any of our prompts in your response on your blog, you create what we call a “pingback” and that pingback appears as a square that includes your post’s title, the name of your blog, and a link back to your post, below our prompt. All the squares appear as a continuous grid, where each square represents the response of another blogger. How would someone contact someone about The Daily Post (wordpress.com) sending email notifications. Hi @seppiedog, the best thing to do is to give us a shout in Support. I wonder why it is that lately trying to copy the pingback link immediately sends the site offline? One then has to copy manually into the post. That sounds strange! Can you give us a shout in Support and let us know the exact steps that creates this problem as well as the browser you’re using? Done. Forgot to mention that I am using Microsoft Edge. Delightful idea! What a great prompt and unique photo. Here is one of mine with a link to 3 other previous ones. Repurposing has been a lifelong thing for me personally so I take photos when I appreciate others creativity. Love it or hate it, recycled art is coming into vogue. If you care to look, it’s everywhere to appreciate and bring awareness to issues confronting the environment. While in Punta Gorda, Belize last summer, I saw this boat made from discarded water bottles by the staff of the Toledo Institute for Development and Environment (TIDE), a local conservation group. Most definitely, it fits the bill. 426 Responses While this challenge is closed to new entries, we encourage you to visit the Reader to find other avid bloggers. I just do it ChrisStyle. Hope to inspire you too! A great way to repurpose ‘old stuff’! Refurbished – Mixing Miles with Media. Repurpose – Weekly Photo Challenge. – The Monica Shastri. Do What You Wish Rest awhile. Oh, the Places We See . . . Weekly Photo Challenge: Clancy’s — repurposed and classy! Third Time Lucky! Repurpose, recycle, revamp, re-use. Musin' With Susan The Daily Post Weekly Photo Challenge-Caught It! Wordpress photo challenge: repurpose. – Write Dorne – Putting life into words. Laurel Grove loves… Recyle your old boyfriend? Yes! Bike parking. Not a good repurpose.